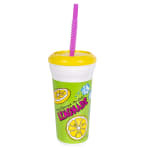 Help merchandise your refreshing lemonade with these plastic lemonade cups from Gold Medal. With a 32 oz capacity these plastic lemonade cups can quench any thirst! Lids and straws are included that are designed to fit the cup and compliment the design. Having designated lemonade cups saves you time and gives the patron something to keep as a souvenir of their dining experience with you. 200 cups, lids, and straws come in one case so that you have everything you need to get started selling lemonade right away!